Marina LED aquarium kits are available in three sizes (5, 10 and 20 gallons). 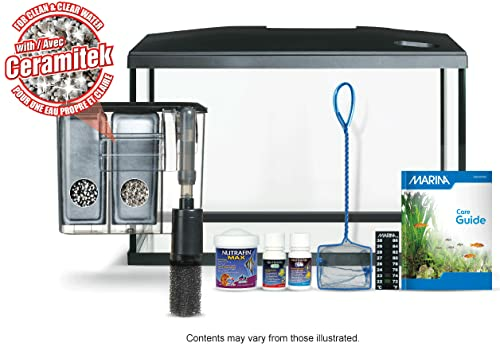 They are one of the best fish tank kits for everyone from beginners to advanced hobbyists. 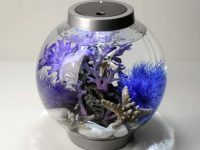 They come with a very clear glass fish tank, bright white LED light, quiet filtration and many other features necessary for a starter to get started his/her first adventure in the fish keeping hobby. While the Marina LED aquarium 20-gallon is ideal for keeping various tropical fish, the 5-gallon and 10-gallon ones are ideal for Bettas, shrimps, and other small tropical fish. All Marina LED aquarium kits come with a fish tank made of long-lasting and clear glass, a hinged canopy, a power filter, an LED light incorporated into the canopy and some other supplies necessary for a fish tank setup. The main tank is well-constructed with high-quality and clear glass with black silicone sealed edges. It is fitted with a hinged canopy which can easily open to access the inside of the tank for setup and maintenance. The lid is drilled with some hoses for feeding fish and placing equipment. A bright white LED light fixture, which provides natural daylight for the entire tank, is stylishly built in the canopy. The new LED lighting technology is for a long-lasting lifetime and stunning effect. There is a switch to turn on or off the light. Marina Slim S series clip on filters are the most powerful things that make Marina LED aquarium kits loved by many customers. 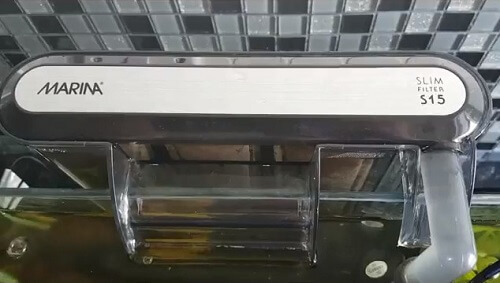 These filters are very efficient to maintain a clean and clear aquarium. With a slim and compact design, the filters don’t need much space behind the tank to place but provides the best and multi-stage filtration with their high-quality cartridges. These filters uses two cartridges (Bio-Carb and Bio-Clear) to completely purify the tank water. These cartridges are wool pads pre-packed with some types of filter media. Both contain Ceramitek, a highly porous ceramic biological filter medium for dealing with harmful ammonia and nitrite. In addition to Ceramitek, the Bio-Carb also contains activated carbon for eliminating heavy metals, odors, impurities and discoloration that keeps the water clear and toxic-free. The filters operate so quiet but provide very strong water flows to properly circulate and purify the water. The Marina S10 features a maximum flow rate (FR) of 55 GPH (gallons per hour) and supports for tanks up to 10 gallons, the Maria S15 FR 71 GPH for 15 gal, the Maria S20 FR 92 GPH for 20 gal. The flow rate of these filters is adjustable with a flow control knob on the water intake. 1. Nutrafin Max tropical flakes provide enough nutrients for tropical fish and keep them healthy. This fish food contains multi-vitamins and natural color enhancers to make your fish more beautiful. 2. Nutrafin Cycle biological filter supplement is to create a biologically well-balanced environment for your aquarium. It helps to immediately remove ammonia and nitrite to protect your fish and prevent fish loss. 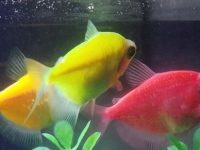 Using this solution in a proper way may help to reserve your aquarium pets in some situations of early stages of a new aquarium or aquarium disasters, which cause sudden breakout of ammonia and nitrite. 3. Nutrafin Aqua Plus water conditioner is to remove chlorine and chloramine from tap water and make it safe for fish, coat and protect scales and fins of newly purchasing fish and reduce fish stress after transportation or water changes. This conditioner can be applied for both freshwater and saltwater. 4. A fish net is for aquarium specimen capture. The net is made from fine soft mesh to protect delicate fins of your fish. 5. A thermometer helps to read the aquarium temperature that is helpful in temperature control and daily maintenance. 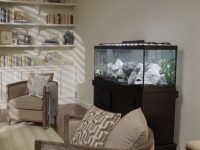 The kit doesn’t come with a fish tank heater for tropical fish; however, you could easily buy one online if you want to build a tropical aquarium. 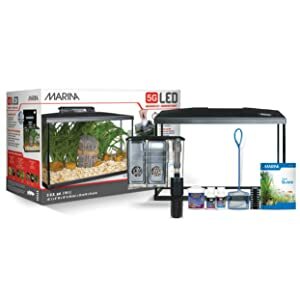 You will need a 25-watt heater for the Marina LED 5 gallon, a 50-watt heater for the Marina LED 10-gallon, and a 100 watt heater if you choose the Marina LED 20 gallon. 6. A care guide that includes advice on how to set up and maintain a fish tank. 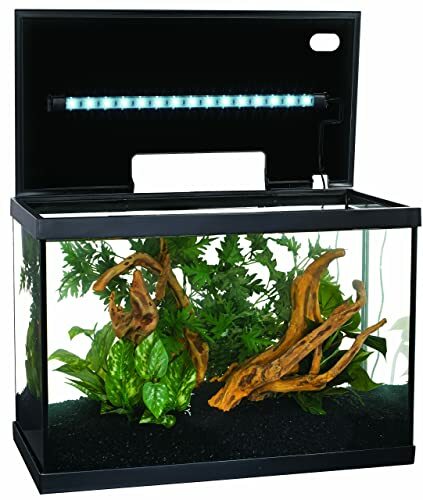 It is very easy to set up and maintain the kit according to the aquarium care guide. All you have to do is buy some plants and gravel packets to fulfill your aquarium installation. Additives: fish food, fish net, Cycle Biological Supplement, Aqua Plus water conditioner, guide. 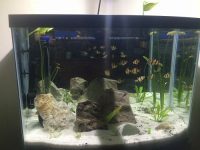 20-gallon (75-liter) is the minimum tank size recommended for a beginner to get started in the aquarium hobby because this size is not so small that the aquarium environment changes quickly that harms the fish but not too large to confuse a beginner. 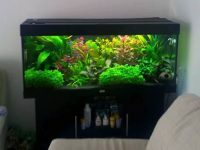 Moreover, you can keep various species of tropical freshwater fish in a 20 gallon fish tank that smaller tanks can’t do. 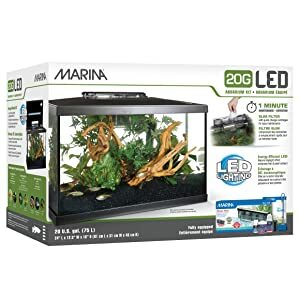 Understand that, I always recommend the Marina LED 20-gallon aquarium kit for any beginners, who don’t have many experience in solving aquarium problems. Additives: fish food, fish net, Cycle Biological Supplement, conditioner, guide. 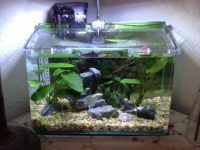 While a 20-gallon aquarium is recommended for beginners who want to start with some tropical fish, a 5 gallon fish tank is commonly chosen as a house for one male Betta or freshwater shrimps. Although a 2.5 gallon fish tank can work well for one male Betta, a 5 gallon one will provide your Betta and some tank mates a larger house to live happily and healthily. As you known, Bettas that have adequate space and enough exercise will live a longer and happier life. So, I strongly recommend the Marina LED 5 gallon for any Betta lovers. A 10 gallon fish tank provides the best house for one male Betta and some tank mates happy and healthy. The larger house you provide for your fish, the healthier the fish are. And because people don’t want to spend more money to buy a very large tank for only one male Betta that makes 10-gallon a great size to get started with. 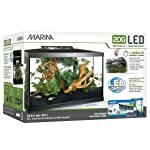 Marina LED aquarium kits come with the great components for running an aquarium but cost very affordable prices. 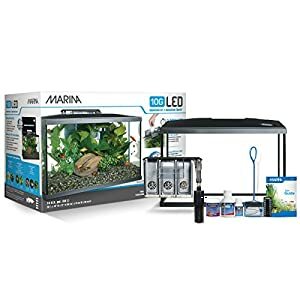 In my opinion, Marina LED aquarium kits are the best products for everyone from the beginners to the advanced hobbyists. I strongly recommend the kit for any starter hobbyists. Based on the fish keeping option of yours, you should choose a suitable aquarium size. There are three sizes of Marina LED aquarium kits (5/10/20 gallons) for you to choose form.